It's different now: UP instead of SP; CTC instead of train orders; crews operating under alcohol testing, instead of under the influence. Tucumcari's not even in the Carrizozo Sub anymore. But back in the early 1980's, the Carrizozo Sub was an amazing place. In just a few short years, Southern Pacific transformed it from a decrepit, one-train-each-way Rock Island connection into a boom railroad, which often ran more than twenty trains in the 16-18 hours per day that the line was not shut down for construction.. The increased traffic ran, barely, on beat-up 112 & 113 pound rail, nominally held in gauge by rotting ties, many of which dated back to El Paso & Southwestern days. Train orders came out of Tucson, created by dispatchers who didn't hold enough seniority to avoid the Carrizozo headache. By 1984, the situation had come to a head. 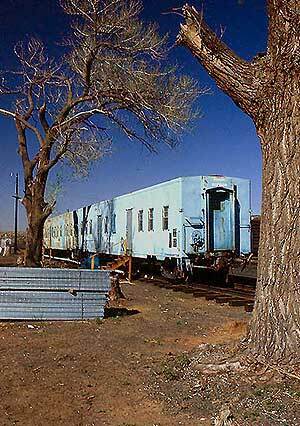 Dog trains, like the KCTUR (Kansas City - Tucson empty reefers) regularly took three crews to make the 188 mile run from Tucumcari to Carrizozo. Even the hotshots often couldn't make the run within the 12 hours allotted by the Hours of Service Act. With the death of the Chicago, Rock Island & Pacific on March 31, 1980, Southern Pacific's subsidiary Cotton Belt absorbed what was left of the Rock's Golden State Route to Kansas City. Employees quickly dubbed it the "Cotton Rock". The Rock Island was in sorry shape: when the company began merger talks with Union Pacific in the mid-1960's, it deferred line maintenence with increased abandon, in anticipation that deep-pockets UP eventually would fix things. But the Interstate Commerce Commission, in one of it's most infamous cases of bungling, took more than a decade to finally arrive at a decision denying the merger. The Rock stumbled along afterward for a few more years in Barringer Blue, and that was that. Southern Pacific's portion of the Golden State Route, the Carrizozo Subdivision, reflected the sad state of affairs on the Rock Island. With little originating / terminating traffic, the Sub was a line haul route dependent upon whatever Rock Island could move without derailing. At the same time, the SP was starting to feel the financial pinch that would drive it to seek merger with Santa Fe and later, Rio Grande. Operations subsisted at low ebb for the first months after the takeover. 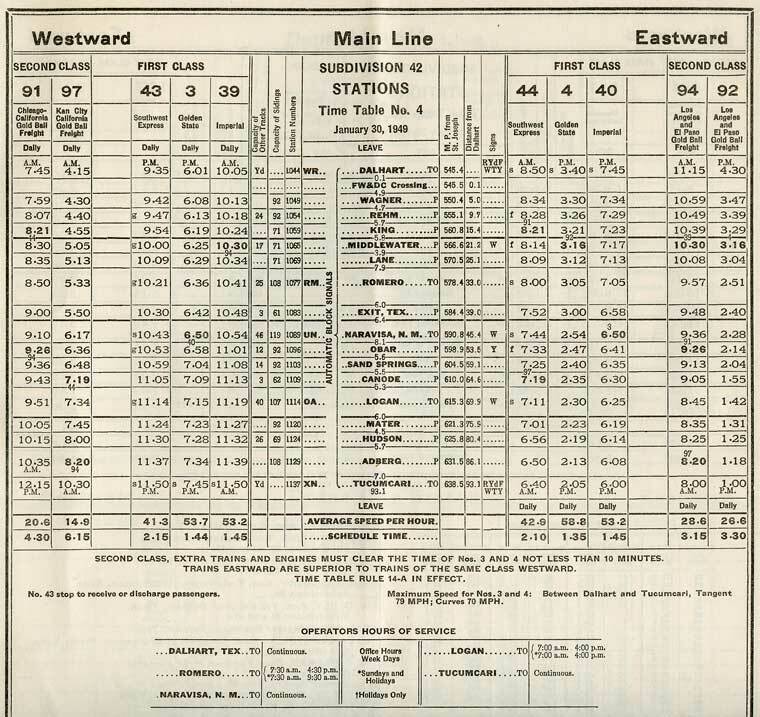 Typically the line hosted only one train each way per day, and Tucumcari had only three regular crews to handle the 330 mile Tucumcari - Carrizozo freight pool. 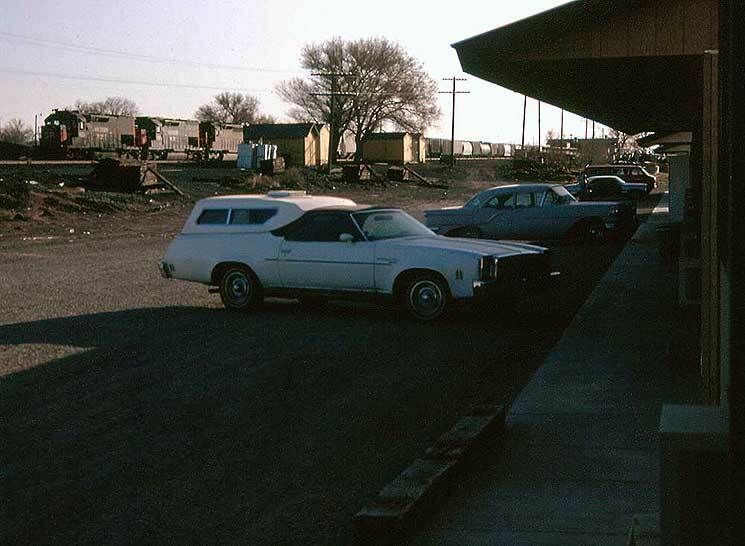 Above and below, we see one-half of the day's activities in June, 1980, as an eastbound exchanges crews, and then makes a setout in the Tucumcari yard. In the lower photo, the crew, now Cotton Belt employees, backs the setout off of the Rock Island Amarillo Main, abandoned beyond Tucumcari six weeks previously. Curving to the left of the lead locomotives is the Cotton belt Dalhart Main leading to Kansas City. The track at far left is the Ballon Track, in the former roundhouse area, used for turning equipment. That dark ballast is cinders from SP's coal burning steam locomotives. Even though the steamers had been gone for thirty years, there were still spots along the line near siding switches where the accumulated cinders from waiting locomotives were still ankle deep. SP held big plans to revive the Golden State Route as a credible competetor to Santa Fe, but a host of problems kept the company perennially cash short, so for the first few years nothing much was done. Traffic did pick up a little, so that by 1981, the line saw about 2-3 trains each way per day. Extensive track rehabillitation finally began in 1983, starting at the west (south) end and progressing north to the extent that the Navahos on the "contract [contractor] gangs" were working well north of Carrizozo by late in the year. These Native Americans could work and drink with the best of them, as I can attest personally. The rehab of the line included ribbon rail, new ties as needed (probably 50% of them), considerable new ballast and the lengthening of sidings. By early 1984, regular work trains operated out of Carrizozo and Santa Rosa - see the Santa Rosa Work Trains page for M/W tidbits - and extra ballast dumping trains ran several times a week. Further north, the Cotton Rock was similtaneously receiving the same treatment, and Tucumcari-to-Vaugn turns frequently forwarded ballast rock from the AT&SF to SSW. 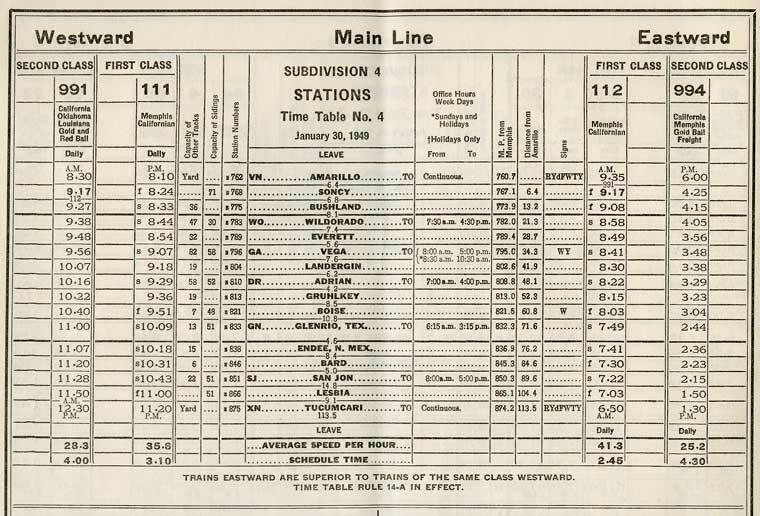 All of this construction activity took place during lengthy midday "windows", with most revenue trains held at Carrizozo and Tucumcari for the duration. Typically however, M/W temporaily lifted the windows to expedite the hot trains, like the Blue Streak Merchandise and the United Parcel Service piggyback. 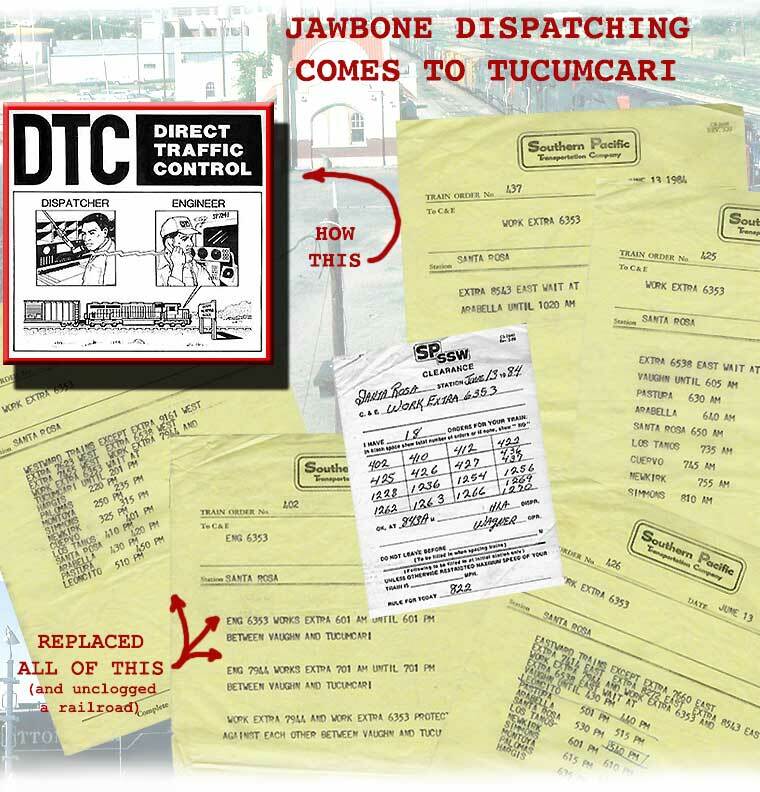 The juggling act between moving freight and advancing reconstruction was a delicate one for dispatchers, who saw a massive increase in traffic begainng in late 1983, when Carrizozo was re established as a crew change point. By early 1984, as many as twenty revenue trains ran over the course of the available 16-18 non-window hours each day, and the freight crew pool had expanded to 18 cars (crews; prior to the pooling of cabooses many years prior, each crew had its own caboose/car). Operationally speaking, the railroad was close to disaster. 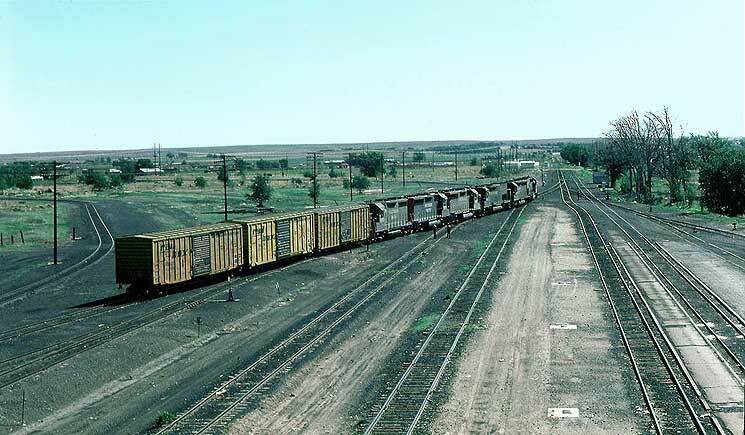 Not helping matters: In the Spring of 1984, a train 'stacked-up' near Ancho, closing the line until the cars could be re-distributed away from the tracks. The company claimed that the engineer created this half-mile stretch of mayhem by speeding through a 30 m.p.h. slow order, although if I recall correctly, they never proved their case because none of the locomotives had event recorders to document the train's speed. 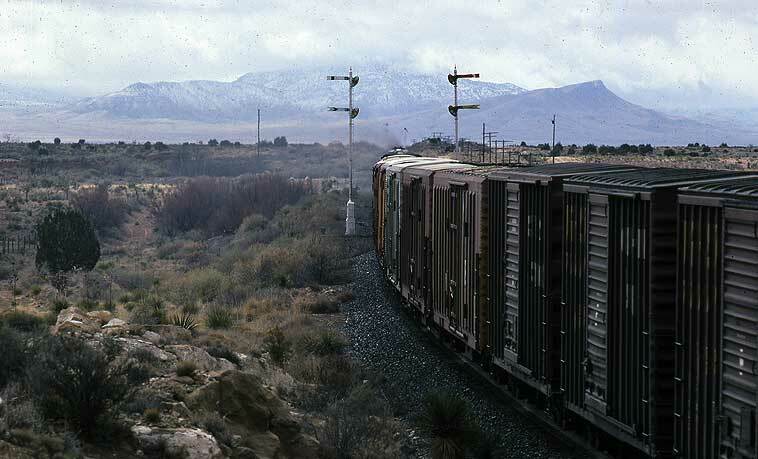 An X-west splitting the semaphores between Ancho and Robsart on March 4, 1983. Gloom obscures Mt. Carrizo ahead. A tie-up in Carrizozo is close at hand. Brian Jennison slide; Wx4 collection. In the line overhaul, SP also used its own track gangs, also heavily manned with Native Americans. In late 1983, a minor official from Dunsmuir was vacationing in the area and decided to go out and do a little recreational efficiency testing of local employees. At some point, he spotted a track gang leaving the job well before their normal off-duty time. Worse (or better, from the predatory official's standpoint), they headed straight for the local cantina. He waited until they all had drinks in their hands, then burst forth into the watering hole with the announcement that, "I'm Road Foreman blankety blank, and you're all out of service for violating Rule G [consuming alcohol while on duty]." As a result, the gang was a bit taken aback, but not totally non-plussed, and they proceeded to drag the official outside and beat the crap out of him. Afterward, the official called the division superintendent in Tucson to complain about the violations and violence, only to hear, "Who in the hell are you, and what in the hell are you doing on my railroad? The official skulked back to Klamath Falls; retired shortly thereafter; passed away in the early 2000's. I've heard this same general story from several fellow rails, though details vary. 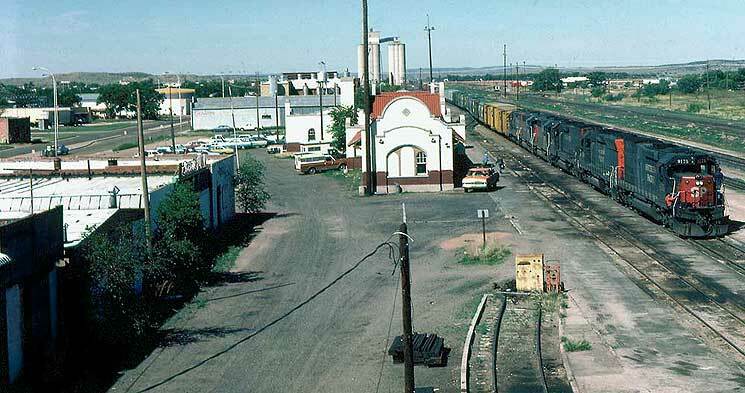 For a few years in the mid-1980's, while SP ironed out the operational wrinkles, Carrizozo returned to its old status as a crew change point on the Tucumcari-El Paso run. The town was no treat: two bars (niether as atmospheric as the jackalope-decorated saloon up at Corona - "Whiskey - The Raod to Ruin"); a handful of mediocre-or-worse restaurants, only one of which stayed open 24 hours under SP contract (the Tradewinds, or "Four Blows"; they served soda crackers with salsa - sacrilege!). Then there was Prem's: This variety store of sorts was run by two old gentlemen of reportedly divergent sexual tastes. One look through the window was enough to scare off most customers. It was that weird. I entered once, and my stongest recollection is of boxes of new shoes...obviously on the shelf since the 1940's. Author John Signor, whose servitude on the Sub predated mine by a few months, also only entered once, and found Kromer caps, Davy Crockett lunch pails, and bought what turned out to be a melted candy bar. Later, old heads told him that if he went back, he was in danger of getting "snake-bit". Although 'Zozo was situated in a relatively pretty high desert setting, the frequent, strong north wind often re-delivered the garbage dump's trash back into town. The business district block near the tracks had burned down some years prior, and the company-provided modular crew quarters, a.k.a. "the modules", contained one TV set in the recreation room; none in the cells. Thankfully, the modules were clean, unlike the pigsty at Ashland, Oregon. In summary., "There's not much to do in a town that has two bars bird-dogged by three trainmasters," as one old head conductor put it. For him, Carrizozo was a big letdown after enjoying the bright lights of El Paso and Juarez during the previous run-through days. A few of the men kept cars parked at the modules (see above), and for the price of a dinner and a few drinks, would haul a carload of guys to Ruidoso, a ski / tourist / horse track town in the mountains to the southeast. There, you could get good food - and whatever else - without being subject to the company's watchful eyes. On several occasions, I spent semi-comotose time under a certain favored pool table in Riudoso, in the company of fellow brakeman Curtis Staggs, whom I would several years later accidentally knock through the Amtrak Wilmington Locomotive Shop's general manager's office wall during a lull in engineer's training. For the most part, though, Carrizozo meant 8-24 hours of layover boredom.